A tiny 3D-printed micro home and outdoor bathtub are now available for overnight visitors, thanks to the Dutch studio DUS Architects. 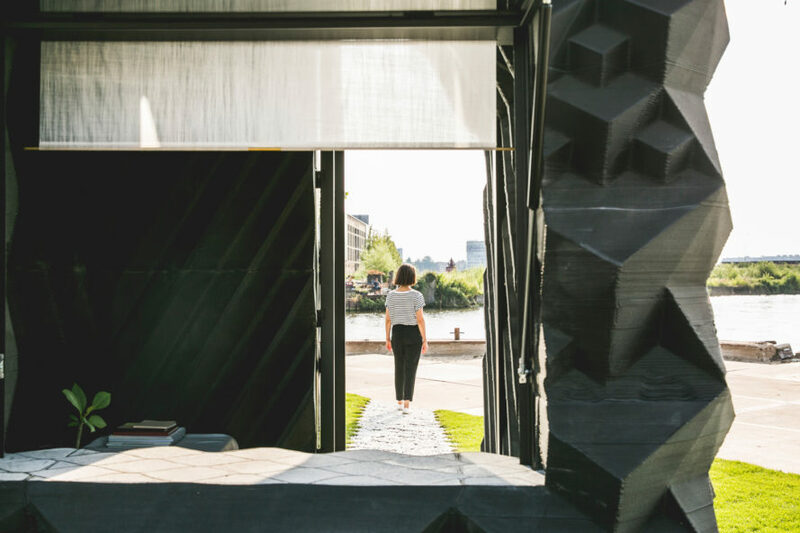 The “Urban Cabin” is located in an a former industrial area of Amsterdam, offering 25 cubic meters of comfort in a sturdy, sustainably produced bioplastic frame. The dwelling will eventually be disassembled and nearly all of its components recycled, hinting at future solutions for urban housing and disaster relief problems. Bioplastic filament made from linseed oil, developed by the architects and manufacturing company Henkel, makes up the sharp black structure. Its three dimensional patterns provide both mesmerizing illusions and structural stability. Plenty of daylight enters the micro home through a large window and front entrance, which is accompanied by a porch and sitting area. 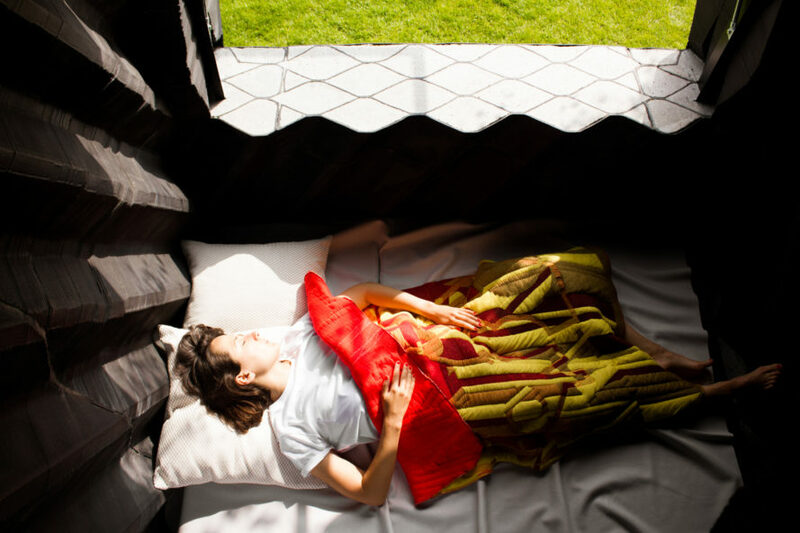 The interior has enough room for a bed, which can fold into seating for daytime lounging. There is not enough room for a bathroom, but the outdoor 3D-printed bathtub lets guests soak under the stars. Concrete is poured for a sturdy foundation inside the home and fills a patterned grid outdoors for a walkway. A pathway of pebbles joins the home to the surrounding sidewalk. The architects hope their designs can lead the way for solutions when disaster strikes. 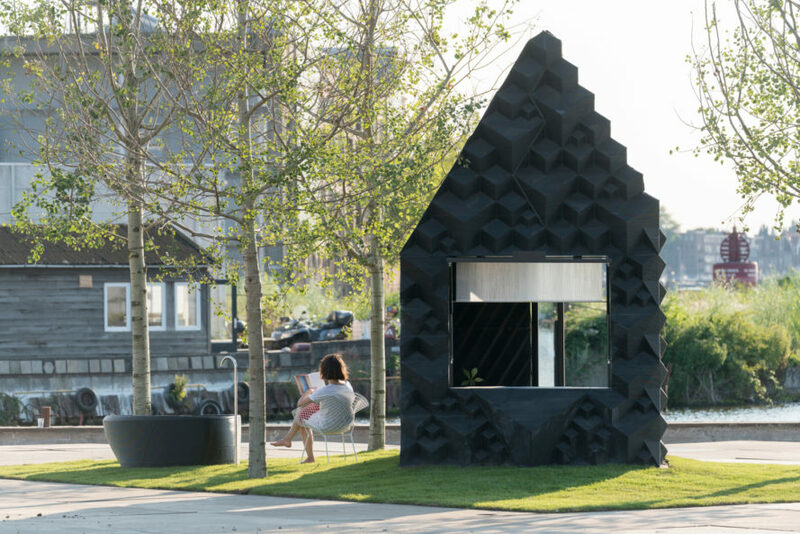 They say, “3D printing techniques can be used particularly well for small temporary dwellings or in disaster areas.” Urban areas constricted by their environment can also benefit from the idea of compact homes. The Urban Cabin is available for short-term rentals by those interested in getting a taste of the micro home life. Bioplastic filament made from linseed oil, developed by the architects and manufacturing company Henkel, makes up the sharp black structure. Its three dimensional patterns provide both mesmerizing illusions and structural stability. Plenty of daylight enters the micro home through a large window and front entrance, which is accompanied by a porch and sitting area. The interior has enough room for a bed, which can fold into seating for daytime lounging. There is not enough room for a bathroom, but the outdoor 3D-printed bathtub lets guests soak under the stars. Concrete is poured for a sturdy foundation inside the home and fills a patterned grid outdoors for a walkway. A pathway of pebbles joins the home to the surrounding sidewalk. The Urban Cabin is available for short-term rentals by those interested in getting a taste of the micro home life.